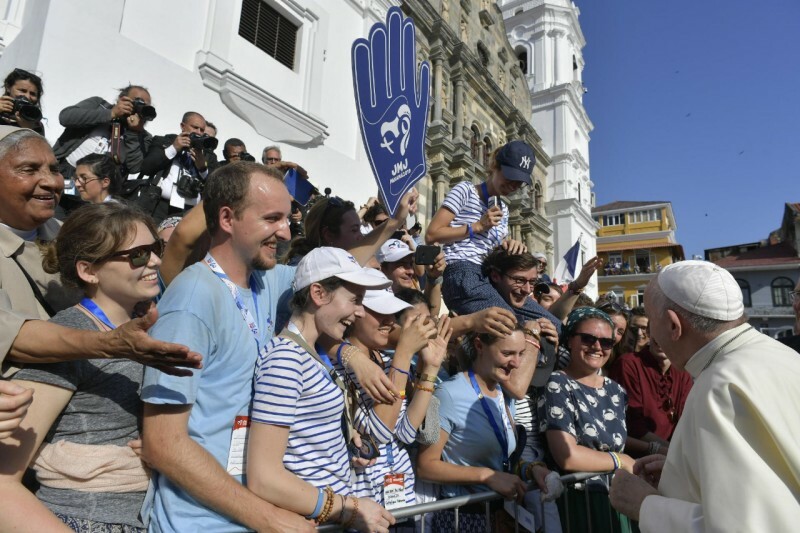 Pope Francis has urged young people in Panama to make God their treasure, and reminded them that they are not ‘the future,’ but ‘the now,’ the present. He did so at the closing Mass of the XXXIV World Youth Day (WYD) in Panama, during his final day of his Apostolic Visit to the country to celebrate World Youth Day 2019, Jan. 22-27, 2019, where it was announced that Lisbon, Portugal, will host the next WYD in 2022. He reminded them that following God, who infinitely loves them, gives life its meaning and enables young people to reach the dreams to which they aspire. Jesus, the Jesuit Pope reminded, is concrete, close, real love and festive joy. The Holy Father noted that in a special way throughout these days, Mary’s fiat has been “whispering like a kind of music” in the background. “The eyes of all in the synagogue were fixed on him. And he began to say to them: ‘Today this Scripture has been fulfilled in your hearing’” (Lk 4:20-21). With these words, the Gospel presents the beginning of Jesus’ public ministry. It started in the synagogue that saw him grow up; he was in the midst of neighbours and people he knew, and perhaps even some of his childhood “catechists” who had taught him the Law. It was an important moment in the life of the Master: the child who was educated and grew up in that community, stood up and took the floor to proclaim and put into action God’s dream. A word previously proclaimed only as a future promise, but now, on the lips of Jesus alone, could be spoken in the present tense, as it became a reality: “Today it has been fulfilled”. Jesus reveals the now of God, who comes to meet us and call us to take part in his now of “proclaiming good news to the poor… bringing liberty to the captives and recovering of sight to the blind, setting at liberty those who are oppressed, announcing the year of the Lord’s favour” (Lk 4:18-19). This is the now of God. It becomes present with Jesus: it has a face, it is flesh. It is a merciful love that does not wait for ideal or perfect situations to show itself, nor does it accept excuses for its appearance. It is God’s time, that makes every situation and place both right and proper. In Jesus, the promised future begins and becomes life. When? Now. Yet not everyone who was listening felt invited or called. Not all the residents of Nazareth were prepared to believe in someone they knew and had seen grow up, and who was now inviting them to realize a long-awaited dream. Not only that, but “they said, ‘Is not this Joseph’s son?’” (Lk 4:22). with his ball? What was born as prophecy and proclamation of the kingdom of God gets domesticated and impoverished. Attempts to domesticate the word of God occur daily. You too, dear young people, can experience this whenever you think that your mission, your vocation, even your life itself, is a promise far off in the future, having nothing to do with the present. As if being young were a kind of waiting room, where we sit around until we are called. And in the “meantime”, we adults or you yourselves invent a hygienically sealed future, without consequences, where everything is safe, secure and “well insured”. A “make-believe” happiness. So we “tranquilize” you, we numb you into keeping quiet, not asking or questioning; and in that “meantime” your dreams lose their buoyancy, they begin to become flat and dreary, petty and plaintive (cf. Palm Sunday Homily, 25 March 2018). Only because we think, or you think, that your now has not yet come, that you are too young to be involved in dreaming about and working for the future. and spaces that encourage dreaming of and working for tomorrow, starting today. And this, not in isolation, but rather side by side, creating a common space. A space that is not simply taken for granted, or won in a lottery, but a space for which you too must fight. práctico). We may possess everything, but if we lack the passion of love, we will have nothing. Let us allow the Lord to make us fall in love! gaze born of fear and exclusion, speculation and manipulation. believed God himself and dared to say “yes” to taking part in this now of the Lord. She felt she had a mission; she fell in love and that decided everything.